Baby Care Expert Rachel Waddilove has created this essential list of everything you need for changing your new baby's nappy. 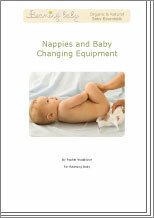 You can choose from disposable or washable nappies, and many parents use a combination of both. It is often a good idea not to buy huge quantities of nappies before your baby is born, as you will need some time to find out what works best for you and your baby. This essential nappy changing shopping list will help you to prepare for your baby and ensure you have everything you need for the next stage.